ACC’s project for the Coalition for Urban Transitions in Ghana took a significant step forward on 25 September 2018 with the hosting of the first Ghana Urbanisation Think Tank. The Think Tank was co-chaired by Sylvanus Adzornu, Director in the Ministry of Local Government and Rural Development and Prof George Owusu of Ghana University, who is also the co-author of Ghana’s National Urban Policy (NUP). 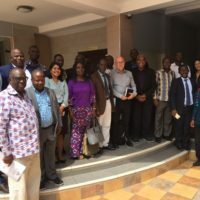 An interdisciplinary community of urban thinkers and influencers convened in Accra and spent the morning deliberating the implications of research by Prof Dan Inkoom, Dr Owusus Amponsah and Eric Abador of Kwame Nkrumah University of Science and Technology that is documenting the impact of the NUP in its first five years. The think tank aims to create a safe “third space” in which difficult questions can be asked and innovations proposed to enrich urban policy in Ghana. Women’s voices, the link between policy and lived reality and the balance between primary and secondary cities all featured in the feedback. The current phase of the think tank will feed into Ghana’s 5-yearly NUP review cycle.